Milton, along with attorney Howard Friedman, previously represented Simon Glik in his high profile lawsuit against three Boston police officers who arrested him for recording. That case led to a federal precedent that recording police and other public officials is a well-established right protected by the First Amendment and resulted in a $170,000 settlement for Glik. Thompson's lawsuit, which was filed in the U.S. District Court in Boston earlier today, seeks monetary damages for violations of Thompson's civil rights as well as legal fees. Thompson was shoved to the ground and arrested by Barboza in January as he stood on his porch recording the officer with his iPhone. Thompson said he began recording Barboza because he was talking loudly on his cell phone and swearing while working a detail. Thompson was charged with wiretapping and resisting arrest. After the arrest, the data on Thompson's phone was wiped while the device was still in police custody. The Fall River police tried to blame Thompson, saying that he must have reset it using a cloud service, but an outside company examined the phone and determined that a member of the police department was responsible. The charges against Thompson were dropped on April 11, but police refused to return his phone so that they could investigate how it was reset. 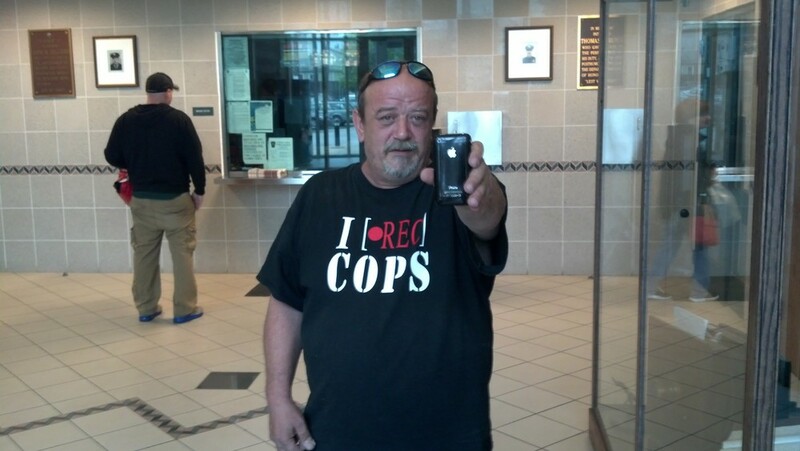 Police did not give Thompson his phone back until May 28, after he obtained a court order requiring them to return it. Barboza has still not been held accountable for his actions by the police department. Thompson filed a complaint after he was arrested and Barboza was punished with a one-day suspension and prohibited from working details for 15 days because he was talking on the phone and swearing when he was supposed to be working, however, he still has not been punished for wrongfully arresting Thompson. When Thompson was still facing charges, Police Chief Daniel Racine said during an interview with WPRI that he supported Barboza's decision to arrest Thompson. Racine has still never publicly admitted that the arrest was wrongful. The person responsible for tampering with Thompson's phone has also still not been held accountable by the department. Racine told WPRI that if it turned out that a member of the police department wiped the phone, he would fire them, but he later went back on his word when that turned out to be the case. When the Racine announced that a member of the police department wiped the phone, he claimed that "the action was not malicious," although he did not say how he came to that conclusion or who was responsible. It is not clear if the city will represent Barboza in defense of the lawsuit. “If it is something job-related, the city represents its employees,” said Lt. Ronald Furtado, a department spokesman.